COSTA MESA, Calif., /PRNewswire/ -- You don't have to hear The Salvation Army's iconic bell to give back to the organization this holiday season. Club Pilates, the nation's largest Pilates franchise, is bringing goodwill to select studios across the country through a holiday partnership with The Salvation Army meant to further the organization's mission of funding local rehabilitation centers that change lives and restore families. As part of the first year of this charitable endeavor, select Club Pilates studios nationwide will be serving as Salvation Army collection centers, inviting both new and existing Pilates enthusiasts to take part in The Salvation Army's noble cause through their generous donations. 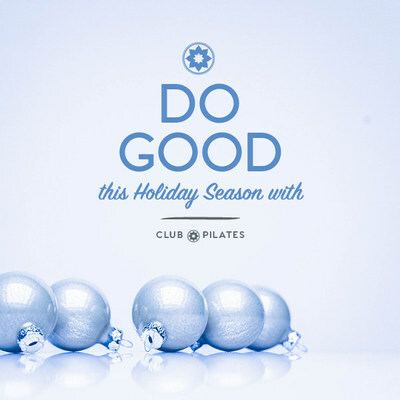 From now until December 31st, Club Pilates members are invited to bring in a Salvation Army donation in exchange for a free class pass for a friend who's never been to Club Pilates in the spirit of paying it forward. Donations can include clothing, household goods, toys and more. "There's no greater time to give back than during the holiday season, and we wanted to give our generous Club Pilates members a place to do just that, while also showing our appreciation to them," said Club Pilates Chief Marketing Officer, Jessica Yarmey. "The Salvation Army is an organization that evokes the spirit of giving, especially during the holidays, and we couldn't be happier to contribute to their mission to meet any and every human need without discrimination." Established in San Diego more than ten years ago, Club Pilates has brought Pilates, the popular low-impact, full-body workout, to the masses with nearly 450 studios nationwide. With a range of class offerings that challenge your mind as well as your body, Club Pilates provides a path to a more fulfilling life with high-quality training at an unexpected value. The public can also support The Salvation Army's local Adult Rehabilitation Centers by shopping at or donating to one of the organization's local Family Stores. Call 1-800-SA-TRUCK or visit SATRUCK.ORG to schedule a donation pickup or to find a nearby Family Store or donation drop-off location. To learn more about Club Pilates or to find a studio near you, visit clubpilates.com. The Salvation Army, established in London in 1865, has been supporting those in need without discrimination for more than 135 years in the U.S. More than 23 million Americans receive assistance from The Salvation Army each year through a range of social services: food for the hungry, relief for disaster survivors, assistance for the disabled, outreach to the elderly and ill, clothing and shelter to the homeless, and opportunities for underprivileged children. For every dollar donated to The Salvation Army, 82 cents is used to support those services in 5,000 communities nationwide. The Salvation Army tracks the level of need across the country with the Human Needs Index (HumanNeedsIndex.org). For more information, go to SalvationArmyUSA.org or follow on Twitter @SalvationArmyUS.